What Are RDAs And DRIs? The Food and Nutrition Board of the National Academy of Sciences set the Recommended Dietary Allowances (RDA). These are nutritional values that guide health professionals and the general public about the amount of nutrition they should take. The Food and Nutrition Board of the National Academy of Sciences set the Recommended Dietary Allowances (RDA). These are nutritional values that guide health professionals and the general public about the amount of nutrition they should take. 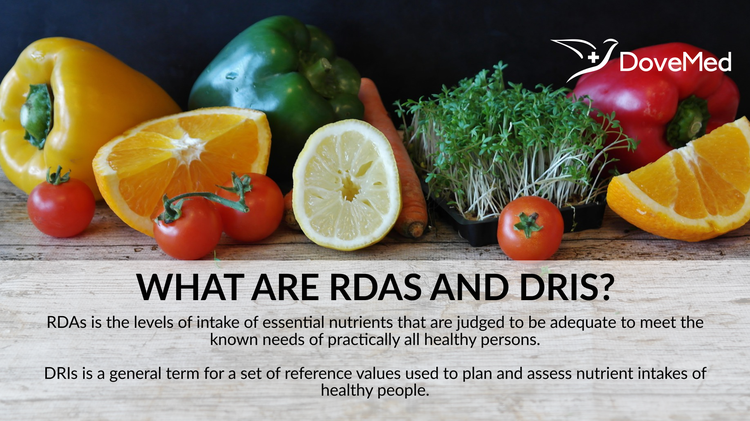 The definition of RDA is the “levels of intake of essential nutrients that are judged to be adequate to meet the known needs of practically all healthy persons”. For instance, the RDA for vitamin C is 60 milligrams every day for adults. They are mentioned on food labels to provide information about the nutritional quality of the food product. They are used by schools, hospitals, nursing homes, and prisons, to plan a balanced and healthy diet. They are used by the food industry to develop new food products. They are used by policy makers to improve food supplies and evaluate the current quality of food. They are used by nutrition workers to educate people about nutrition. The Recommended Dietary Allowances (RDAs) were first published in 1941. Since then, it has been updated ten times. Most recently, they were updated in 1989 when RDAs were established for protein, 7 minerals, and 11 vitamins. They were laid down for different groups of people - pregnant women and nursing mothers, men, and women. Data was found to be insufficient for 7 nutrients to set RDAs, thus the Estimated Safe and Adequate Daily Dietary Intakes (ESADDIs) came about. In order to prevent chronic disease and encourage health and performance, higher intakes of certain nutrients was required. Food fortification and the intake of dietary supplements had increased enormously. The existing RDAs did not sufficiently distinguish between nutrition guidelines for groups, for populations, and for individuals. Thus, the Food and Nutrition Board decided to take a new and more comprehensive approach towards establishing nutritional guidelines in 1995. The current RDAs were replaced and elaborated with Dietary Reference Intakes (DRIs) to give information about nutritional needs for different settings. Recommended Dietary Allowance (RDA): It is the average everyday intake of a nutrient that is enough to meet the requirement of 97%-98% of healthy people. Adequate Intake (AI): It is the value for a nutrient that is similar to ESADDI and is set only when RDA cannot be established. It is based on observed intakes of the nutrient by a group of healthy people. Tolerable Upper Intake Level (UL): It is the greatest daily intake of a nutrient that is likely to pose no risks of toxicity for almost all individuals. Risk of toxicity increases as intake increases above the set UL value. Estimated Average Requirement (EAR): It refers to the amount of a nutrient that is estimated to meet the requirement of half of all healthy individuals in a population. RDAs, AIs, and ULs are specific for individuals, whereas EARs are specific for groups and populations. On November 30, 2010, the Institute of Medicine set out new DRIs for calcium and vitamin D. In comparison to the information used when the values for these nutrients were set in 1997, the new DRIs are based on better-quality studies and fresh information. A DRI summary guide has been created by a committee of experts to help people understand the values and their applications. Publications have also been made available for people to understand the considerations involved in planning and evaluating healthy diets. Yates, A. A., Schlicker, S. A., & Suitor, C. W. (1998). Dietary reference intakes: the new basis for recommendations for calcium and related nutrients, B vitamins, and choline. Journal of the American Dietetic Association, 98(6), 699-706. Monsen, E. R. (2000). Dietary reference intakes for the antioxidant nutrients: vitamin C, vitamin E, selenium, and carotenoids. Journal of the American Dietetic Association, 100(6), 637-640. Ross, A. C., Manson, J. E., Abrams, S. A., Aloia, J. F., Brannon, P. M., Clinton, S. K., ... & Shapses, S. A. (2011). The 2011 report on dietary reference intakes for calcium and vitamin D from the Institute of Medicine: what clinicians need to know. The Journal of Clinical Endocrinology & Metabolism,96(1), 53-58. National Research Council (US). Committee on Dietary Allowances, National Research Council (US). Food, & Nutrition Board. (1980). Recommended dietary allowances (Vol. 2941). National Academies. Murphy, S. P. (2008). Using DRIs as the basis for dietary guidelines. Asia Pacific journal of clinical nutrition, 17(S1), 52-54. Eldridge, A. L. (2003). Comparison of 1989 RDAs and DRIs for Fat-Soluble Vitamins. Nutrition Today, 38(4), 146-149. Dwyer, J. (2000). Old wine in new bottles? The RDA and the DRI. Nutrition, 16(7), 488-492.